Zanele Muholi, Faniswa, Seapoint, Cape Town, 2016. Gelatin silver print. Zanele Muholi, Vile, Gotenburg, Sweden, 2016. Gelatin silver print. Zanele Muholi, Xiniwe II at Cassilhaus, North Carolina, 2016. Gelatin silver print. Zanele Muholi, Namhla I, Cassilhaus, North Carolina, 2016. Gelatin silver print. Zanele Muholi, Gcina I, Cassilhaus, Chapel Hill, North Carolina, 2016. Gelatin silver print. Zanele Muholi, Phaphama at Cassilhaus, North Carolina, 2016. Gelatin silver print. Zanele Muholi, Bakhambile, (Parktown), 2016. Gelatin silver print. Zanele Muholi, Basizeni XI, Cassilhaus, North Carolina, 2016. Gelatin silver print. Zanele Muholi, Thuleleni, Biljmer, Amsterdam, 2017. Gelatin silver print. Zanele Muholi, Bukhosi II, Parktown, 2016. Gelatin silver print. 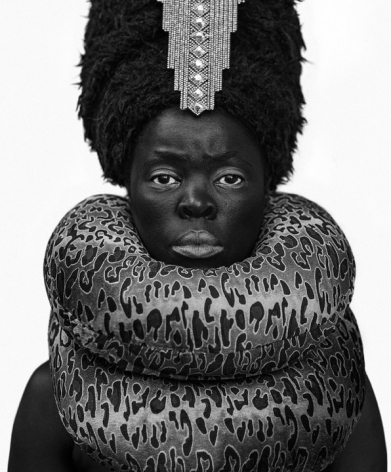 Zanele Muholi, Thulile II, (Umlazi, Durban), 2016. Gelatin silver print. 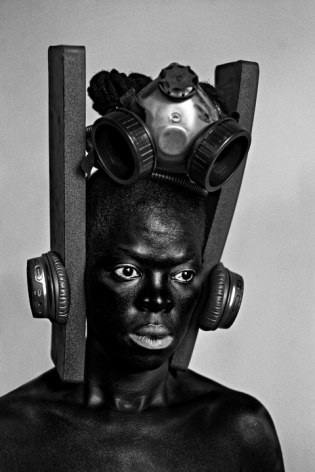 Zanele Muholi, Ntozabantu VI (Parktown), 2016. Site-specific wallpaper. Zanele Muholi, Yaya Mavundla I, Parktown, 2017. Gelatin silver print. 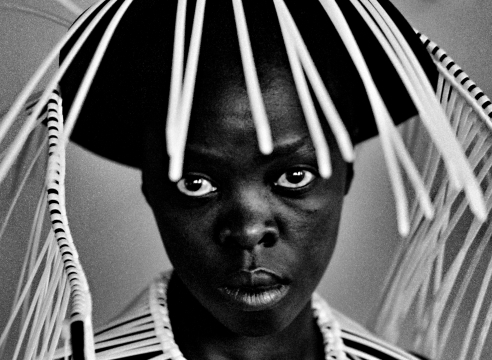 Zanele Muholi, Dimpho Tsotetsi, Pretoria, 2017. Gelatin silver print. Zanele Muholi, Yaya Mavundla, Parktown, Johannesburg, 2014. Gelatin silver print. 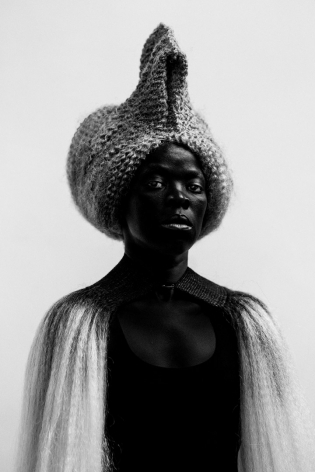 Zanele Muholi, Ntsantsa, Tsakane, Johannesburg, 2013. Gelatin silver print. 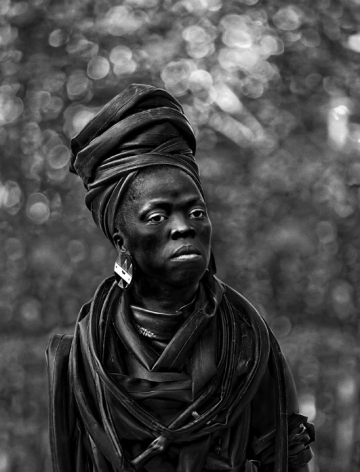 Zanele Muholi, Yaya Mavundla, Parktown, Johannesburg, 2013. Gelatin silver print. Zanele Muholi, somizy Sincwala, Parktown, 2014. Gelatin silver print. Zanele Muholi, Yaya Mavundla II, Parktown, Johannesburg, 2017. Gelatin silver print. Yancey Richardson Gallery is pleased to present a solo exhibition by artist and visual activist, Zanele Muholi. This is the artist’s third exhibition with the gallery. Comprising two bodies of work, Brave Beauties, on show in New York for the first time, and Somnyama Ngonyama (‘Hail, the Dark Lioness’), the exhibition brings together two integral elements within Muholi’s practice: intimate studies of queer life in her native South Africa and self portraiture. Begun in 2014, Brave Beauties is a series of portraits depicting transwomen in South Africa, and as such represents an overt challenge to a culture that continues to violently discriminate against the LGBTQI community. In a similar vein to the ongoing project Faces and Phases, Muholi creates celebratory photographs of empowered individuals who assert their identities through their confident poses, taking ownership of the spaces they inhabit. Turning the camera on herself for the Somnyama Ngonyama series, Muholi explores the concepts of self-representation and self-definition by experimenting with different characters and archetypes. The photographs, taken in various cities throughout Europe, the U.S., Asia and Africa, use ad hoc settings and everyday everyday objects as props to reference South African political history, contemporary existence and events in the artist’s personal life. Seen together, these images map her movements as she travels across the world. One image from this series will be exhibited as a floor to ceiling photographic mural. Monumental in scale, the photograph boldly asserts its status as a singular object, forcing the viewer to confront their desire to gaze at Muholi’s black figure. In both bodies of work, Muholi uses portraiture as a form of exposure to disrupt the dominant images of black women in the media today and to bear witness to both the brutality and the joy of black, queer, lesbian, and transgendered individuals in South Africa. In 2009 Muholi founded Inkanyiso, a non-profit organization dedicated to visual art, media advocacy, and visual literacy training for South Africa’s LGBTQI community. In 2017, Muholi participates in Performa 17’s “South African Pavilion Without Walls,” by presenting large-scale portraits in public spaces across New York City, including Times Square. In Spring 2018, Aperture will release the monograph Somnyama Ngonyama, featuring one hundred images from the series and twenty-three texts by writers, artists and poets. Muholi lives in Johannesburg. Her work has been exhibited at Documenta 13; the South African Pavilion at the 55th Venice Biennale; and the 29th São Paulo Biennale. Solo exhibitions have taken place at the Autograph ABP, London; Stedelijk Museum, Amsterdam; Kulturhistorek Museum, Oslo; Einsteinhaus, Ulm; Schwules Museum, Berlin; Casa Africa, Las Palmas and Brooklyn Museum, New York. Her work is included in the collections of the Boston Museum of Fine Arts; the Brooklyn Museum; the High Museum of Art; the Carnegie Museum of Art; the Guggenheim Museum; the Museum of Modern Art, New York; the San Francisco Museum of Modern Art; the Tate Modern, London; and the Victoria and Albert Museum, London among others.